You might recognize Precor treadmills if you’ve ever had a gym membership. Its treadmills and rowing machines are a staple for hotel and box gyms and have been for decades. Precor was even the first company to create an ergonomically designed rower that changed the game. It’s also the company that brought us the elliptical trainer and eventually formed the trend that brought forth cushioned treadmills. Precor has been ahead of the game since before the game even took off, and it remains an industry leader today. In addition to commercial equipment, the company also produces several home lines that mirror what people tend to love about its famous products: power, precision, and aesthetics. At the same time, Precor machines come with a hefty price tag, particularly now that so many budget options remain available. You might wonder: what kind of treadmill do you get for all that cash, and it is worthwhile? Most would argue that if you have the means, then a Precor treadmill is an excellent buy because between the warranty and quality, you’ll undoubtedly get your money’s worth. Is a Precor product right for you? Read our full Precor treadmill review to find out if a Precor should become your next piece of home fitness equipment. Precor offers two home-use treadmill lines: Precision™ and Energy ™. The Precor Precision series features two models the TRM 425 and TRM 445. Precor’s Precision line includes a standout feature titled the Ground Effects Control System. Precor deploys the system as shock absorption, and it works to keep the treadmill deck centered even at high speeds or with heavy blows. A centered deck keeps the treadmill feeling sturdy and stable while also adding comfort control for your stride. Here are the need-to-know specs for both the 425 and 445. The TRM 425 comes with a speed range of 0.5 to 12.0 mph and a two percent decline to 15 percent incline range. Its display is a five-inch high contrast LCD display that shows 13 workout metrics and offers ten built-in workout programs. The treadmill performs additional monitoring using the digital touch sensor and the included chest strap. There is no USB port, and you cannot charge your device using this model. The Ground Effects Control system means that you get both vertical and horizontal impact absorption for a more comfortable ride. Finally, the platform width is 22 inches, which is larger than the Energy series’ 20-inch platform. The Precor TRM 445 features a speed range of 0.5 to 12.0 miles-per-hour and the same two percent decline and 15 percent incline as the TRM 425. Additionally, it has the same platform width at 22 inches and also benefits from the vertical and horizontal stabilization system that all Precision treadmills receive. However, the TRM 445 is a slightly higher-end model less in function and more in added accessories. It offers a seven-inch LCD graphic display that shows off 27 tracked metrics and a whopping 39 programmed workouts. It also offers USB port for charging. The Energy series includes a different shock absorption system known as Energy Stride Technology. The technology features a deck mounting system that reduces the impact of the shock reverberating back to your stride. Compared to the Precision series, the Energy series offers less shock absorption. The Ground Effects Control System provides both vertical and horizontal shock absorption. However, the Energy Stride Technology only includes vertical shock absorption. The TRM 211 is the most basic Precor home treadmill available on the market. It’s reliable and sturdy and offers the essential functions like 0.5 to 12.0 miles-per-hour speed and 0% to 15% incline. But everything else remains relatively simple. For example, it only offers a blue and white LCD screen and only tracks nine metrics. It features only six built-in programs, and it’s the only Precor treadmill to include a digital touch sensor without a wireless option. Additionally, it comes with a shorter warranty. The Energy series generally only includes five-year parts and wear warranty compared to the ten-year found on the Precision series. The TRM 223 is a step up regarding programming and display. It comes with the same basic features but includes an upgrade to a five-inch high contrast LCD with 13 metrics, nine programmed workouts and the wireless option for the digital touch sensor. The TRM 243 takes another step up from both the TRM 221 and TRM 223. It includes a seven-inch color LCD graphics display. You’ll enjoy 27 different workout metrics as you complete the 39 available programs. 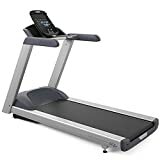 The most significant difference between each available treadmill lies typically in size of the treadmill and the number of built-in programs and added features. Size makes a serious difference depending on your height and the type of training you wish to do. A smaller treadmill best suits shorter strides (and shorter legs). You’ll struggle to complete sprint or endurance training comfortably on the smallest treadmills. If you’re training on a regular basis, you’ll notice the difference between the 20-inch platform on the Energy series and the 22-inch platform found on the Precision series. You might also notice a difference in the shock absorption. You get extra help from the Precision series’ vertical and horizontal shock absorption compared to the vertical-only feature on the Energy series. What features will you always get with a Precor treadmill? We found more than a few. Precor started using cushioned tracks on its treadmills far before anyone else. The Ground Effects system found on the Precision series represents an evolved version of the company’s official foray into stabilization systems. We like the cushioning system because it recognizes when your feet leave and land on the track. It remains firm to help you maintain proper form, but its soft when you land to protect your knees, ankles, hips, and back. The consoles included on the treadmills are one of our favorite parts of Precor treadmills generally. Typically, at home treadmills skimp on console features, saving them for commercial orders. The console includes customizable programming. Though, the number of programs varies according to the model. It also tracks your progress and saves data for four unique users. The breadth of programming only makes sense when the motor is available to support it. Precor uses commercial-grade motors in its home products, which supports the programming and long-term, heavy-duty use. Incline is now a standard feature on many treadmills. The cheapest of the lot tend to offer it, even if it is a manual function. Precor also includes a decline function as well. We love this because it creates a well-rounded machine. Traditionally, you can use flat or incline-training to work on acceleration training. A decline function allows you to try out deceleration training just as you would if you ran up and down a hill. Of course, it doesn’t replace the real thing. Because the belt is moving, you don’t project nearly as much force into your quads. However, it does help you prepare for more decline and deceleration training should you choose to go outdoors. Precor offers a lifetime warranty on treadmill frames and weldments for all of its available models. It also provides a five-year warranty that covers parts and wear for the Energy series and 10-year cover for the Precision series. Finally, you get a three-year warranty on the console and only one-year for labor. Precor treadmills are unique because they include features that you typically only find in commercial machines. The three to four horsepower motor is a primary example. One of the things that traditionally limits at-home treadmills is the lack of engine power and the size. Many home treadmills, particularly in the budget sector, are better for short, brisk walks. By adding a powerful motor and increasing the size, Precor created an at-home treadmill that suits people who make treadmill workouts part of their regular training program. The motor allows you to change speeds and inclines quickly and reach up to 13 miles-per-hour with little problem. Its size gives you the room you need to run comfortably at any speed. Its cushioning system is no longer unique among treadmills, but we do appreciate the value it adds when paired with the rest of the machine. Precor’s uniqueness tends to lie in its strengths, but there are some weaknesses. At this price point, customers expect additional multimedia options in the console. The expectation isn’t outlandish; commercial gyms started offering these features years ago. Given the high price tag, it is surprising that these features haven’t shown up yet. Customer opinions of the treadmill tend to depend on what kind of runner they are and what treadmills they previously owned. Those upgrading from cheap, folding treadmills are more likely to find that their new Precor treadmill solves many of their problems. These are the customers who are most likely to notice the shock absorption features and the impact the function has on their joints. People who upgrade from cheaper, smaller treadmills also notice that the body is long enough for even taller runners. Their note isn’t a surprise as many home treadmills feature a shorter belt to become more compact. Short belts reign in your stride, particularly if you are tall. 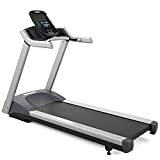 Serious runners like those who put over 50 miles on their treadmill each week have issues with the display on the cheaper models, like the Energy TRM 211. They don’t like how tracked metrics get displayed and find the programs limiting. Some road runners also don’t like the shock absorption. The high-level of absorption may feel ‘bouncy’ for runners unused to the feature or those who complete most of their miles on the road. Finally, it’s worth noting that shock absorption doesn’t prevent injury. It only takes the pressure off the joints. Other issues like gait, stride, and stretching contribute more to injury prevention. If you want a sturdy, almost commercial-like treadmill, Precor isn’t your only option. Life Fitness also manufactures both commercial and home treadmills with a similar value proposition. Both Life Fitness and Precor feature a minimum 3.0 horsepower continuous-duty motor. Though, ultra-premium life Fitness motors may reach 4.0 horsepower, which you almost always find exclusively reserved for commercial gyms. Both also provide a maximum speed of 12 miles per hour and a 0 to 15 percent incline. However, only the Precor Precision range offers a decline feature as well. Precor offers a running surface that lies between 56 and 60 inches depending on the model. We like this because it gives those with slightly smaller spaces the option to invest in a high-end treadmill without worrying about space. All Life Fitness treadmills are 60 inches long, which provides the most space for your stride. Overall, no standout feature differentiates these treadmills beyond the decline function offered by Precor. Choosing the right one depends on what brand provides the features you find most valuable for the right price. Precor treadmills are an excellent option for those with the cash to hand over for a premium home treadmill. If you’re used to a low horsepower, folding model, then you will feel the difference immediately. At the same time, Precor doesn’t always offer enough exciting features to justify its price tag. You might expect more media options or new technology to accompany a machine of that caliber. Still, Precor is a good, sturdy option for anyone who runs regularly and enjoys the shock absorption properties offered by the machines. Those looking for a simple space to walk indoors may choose to look elsewhere.